Bake a rich, buttery brioche for special guests or a family weekend. 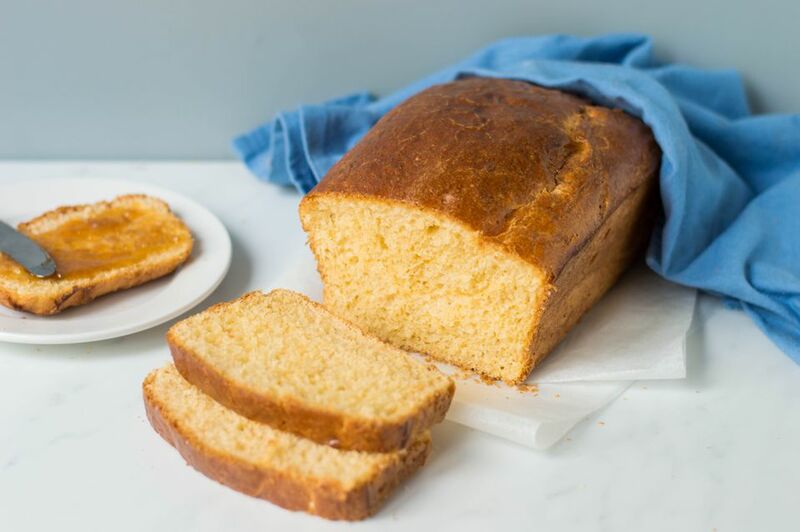 This classic French bread, with its slightly sweet flavor and tender texture, makes wonderful toast or sandwich bread; use any leftovers for French toast or bread pudding. The lengthy kneading process calls for a heavy-duty stand mixer with a dough hook. Be prepared for starts and stops with this recipe; the dough must rest and rise at a few different times, with six hours or up to overnight in the refrigerator. The traditional brioche à tête uses a round fluted pan with an extra ball of dough perched in the center, resulting in a little "cap" on the decorative loaf. But you can bake it in a regular bread pan just as well or make a braided loaf for the visual "wow" factor. In the bowl of an electric stand mixer, combine the yeast with the warm milk and let it stand for a few minutes or until it turns bubbly. With the paddle mixer attachment, stir in 1 cup of flour and 1 egg. Remove the bowl from the mixer and sprinkle 1 cup of flour over the mixture. Cover with plastic wrap and let it stand in a warm place for 25 to 40 minutes, or until the surface of the flour has a cracked appearance. Lightly beat the remaining 5 eggs. Using the dough hook of your stand mixer, mix ​in the sugar, salt, the beaten eggs, and the remaining 1 3/4 cups of flour. Mix on low for a minute or two, then increase the speed to medium and continue to mix for about 15 minutes, or until the dough starts wrapping itself around the dough hook. Add more flour, a few teaspoons at a time, as necessary to coax the dough from the sides of the mixing bowl. The dough should be shiny and feel a little bit sticky. Turn the mixer to low and add the butter, 2 or 3 tablespoons at a time. After you incorporate all of the butter, increase the speed to medium and beat the dough for about 3 to 4 more minutes, again adding small amounts of flour as needed to coax the dough from the sides of the mixing bowl. It should be smooth and appear somewhat shiny. Transfer the dough to a lightly floured surface, knead it a few times by hand, and gather it into a ball. Place the ball in a large oiled bowl, turning it to grease both sides. Cover the bowl tightly with plastic wrap and set the dough in a warm place to rise until it doubles in size, about 2 hours. Place a sheet of parchment paper on a large baking sheet and sprinkle it generously with flour. Spread the dough out on the parchment, sprinkle it with more flour, and cover it with a sheet of parchment and a towel. Put it into the refrigerator to rest for at least 6 hours or overnight. Generously grease two large (about 9x5x3-inch) loaf pans. Shape the chilled dough into two large loaves, cover each with a towel and let them rise in a warm place for about 1 to 2 hours, or until the dough reaches about 1/2 to 1 inch above the pans. Whisk together 1 egg and 2 teaspoons of water. Gently brush the loaves with the egg wash.
Bake the loaves for 30 to 35 minutes, or until they turn golden brown and sound hollow when tapped. The internal temperature should register from 190 F to 205 F, for softer and crustier loaves, respectively. Cool the loaves on a rack for about 45 minutes before serving. Store brioche tightly wrapped in plastic at room temperature for up to two days. To freeze brioche, wrap a cooled loaf tightly in plastic wrap, then cover it with foil and freeze it for up to four to six weeks. Thaw it at room temperature, still wrapped. To reheat brioche, put it in a 325 F oven until the outside turns crisp, about 15 minutes for a loaf. Or, wrap a few slices in foil and heat them just until warm, about 5 minutes.